Neodymium (chemical symbol Nd, atomic number 60) is a silvery metallic element that is a member of the lanthanide series of chemical elements. It is considered one of the "rare earth metals," but it is not rare when compared to the abundance of other metals. It constitutes about 38 parts per million (ppm) of the Earth’s crust. In nature, neodymium is found not as the free element but in ores such as monazite sand ((Ce,La,Th,Nd,Y)PO4) and bastnasite ((Ce,La,Th,Nd,Y)(CO3)F), which contain small amounts of various rare earth metals. Neodymium can also be found in Misch metal, an alloy of rare earth elements in a range of naturally occurring proportions. Its proportion in Misch metal can be as high as 18 percent. It is, however, difficult to separate neodymium from other rare earth elements. Neodymium was discovered by Baron Carl Auer von Welsbach, an Austrian chemist, in Vienna in 1885. He analyzed the material known as didymium and separated the elements neodymium and praseodymium from it. Neodymium, however, was not isolated in relatively pure form until 1925. The name neodymium is derived from the Greek words neos, meaning "new," and didymos, meaning "twin." Today, neodymium is primarily obtained through an ion exchange process of monazite sand ((Ce,La,Th,Nd,Y)PO4), a material rich in rare earth elements, and through electrolysis of its halide salts. Neodymium is an inner transition metal (or lanthanide) that lies in period 6 of the periodic table, between praseodymium and promethium. It has a bright, silvery metallic luster, but as one of the more reactive rare earth metals, it quickly tarnishes in air. The tarnishing process involves the formation of an oxide layer that falls off, exposing the metal to further oxidation. Naturally occurring neodymium is composed of 5 stable isotopes—142Nd, 143Nd, 145Nd, 146Nd, and 148Nd—and 2 radioisotopes, 144Nd and 150Nd. The most abundant stable isotope is 142Nd, with a natural abundance of 27.2 percent. Many radioisotopes of neodymium have been characterized. The most long-lived ones are 150Nd, with a half-life (T½) of >1.1×1019 years; 144Nd, with a half-life of 2.29×1015 years; and 147Nd, with a half-life of 10.98 days. All the remaining radioactive isotopes have half-lives that are less than 3.38 days, and the majority of these have half-lives that are less than 71 seconds. This element also has 4 meta states. Neodymium is a component of didymium glass, which is used to make specialized goggles for welders and glass blowers. Neodymium colors glass in delicate shades, ranging from pure violet through wine-red and warm gray. 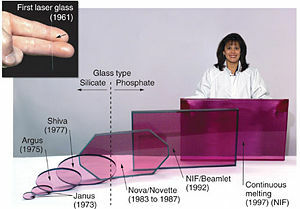 Light transmitted through such glass shows unusually sharp absorption bands. The glass is used in astronomical work to produce sharp bands by which spectral lines may be calibrated. Neodymium is also used to remove the green color caused by iron contaminants from glass. Neodymium salts are used as colorants for enamels. Neodymium is combined with iron and boron to produce the strongest permanent magnets known, also called NIB magnets. Their chemical formula is Nd2Fe14B. They are cheaper, lighter, and stronger than samarium-cobalt magnets. Neodymium magnets appear in high-quality products such as microphones, professional loudspeakers, in-ear headphones, and computer hard disks, where low mass, small volume, or strong magnetic fields are required. Nd3+ has been reported to promote plant growth, probably because of similarities to Ca2+. Compounds of rare earth elements are frequently used as fertilizers in China. The size and strength of a volcanic eruption can be predicted by scanning for neodymium isotopes. The neodymium isotope composition of volcanic lava offers a gauge for the magnitude of a forthcoming volcanic eruption. Scientists can thus use this information to predict the size of an impending eruption and send a warning to residents of the area. Certain transparent materials with a small concentration of neodymium ions can be used in lasers as gain media for infrared wavelengths (1054-1064 nm). Examples of these materials are neodymium-doped yttrium aluminum garnet (Nd:YAG), yttrium lithium fluoride (Nd:YLF), and yttrium orthovanadate (Nd:YVO4). Neodymium glass (Nd:Glass) solid-state lasers are used in extremely high-power (terawatt scale), high-energy (megajoules) multiple beam systems for inertial confinement fusion. Neodymium metal dust is a combustion and explosion hazard. Neodymium compounds, like all rare earth metals, are of low to moderate toxicity; however, its toxicity has not been thoroughly investigated. Neodymium dust and salts are very irritating to the eyes and mucous membranes, and moderately irritating to skin. Breathing the dust can cause lung embolisms, and accumulated exposure damages the liver. Neodymium also acts as an anticoagulant, especially when given intravenously. Neodymium magnets have been tested for medical uses such as magnetic braces and bone repair, but biocompatibility issues have prevented widespread application. ↑ Neodymium is frequently misspelled as neodynium. ↑ The effect of neodymium on some physiological activities. Retrieved June 21, 2007. "Neodymium" Los Alamos National Laboratory, Chemistry Division. Retrieved February 20, 2007. Cotton, F. Albert, and Wilkinson, Geoffrey. 1980. Advanced Inorganic Chemistry. 4th ed. New York: Wiley. ISBN 0-471-02775-8. Greenwood, N. N. and Earnshaw, A. 1998. Chemistry of the Elements. 2nd ed. Oxford, U.K.; Burlington, MA: Butterworth-Heinemann, Elsevier Science. ISBN 0750633654. Online version. Retrieved June 22, 2007. Jones, Adrian P.; Wall, Frances; and Williams, C. Terry, eds. 1996. Rare Earth Minerals: Chemistry, Origin and Ore Deposits. The Mineralogical Society Series. London, UK: Chapman and Hall. ISBN 0412610302 and ISBN 978-0412610301. Stwertka, Albert. 1998. Guide to the Elements. Rev. ed. Oxford, UK: Oxford University Press. ISBN 0-19-508083-1.